Pure, unspoilt nature: Travel relaxed by bus and train to the starting point – then enjoy hiking and mountain climbing in the midst of the uniquely protected mountain landscape of the Berchtesgaden Alps. Königssee, Watzmann and Steinernes Meer are the high points of this breathtakingly scenic four-day tour that will come up with many more highlights. Just let all the sensations overwhelm you! Spend the nights in the comfortable mountain huts, and enjoy the lake-crossing of Königssee as a crowning finale – the best ingredients for a short holiday. You can reach Königssee comfortably and relaxed by rail and bus. On arrival, leave the hustle and bustle to the left behind you and go up the starting ramp of the famous luge track: Georg Hackl made history here. Now briefly follow the Klingerbach channel until you get to a fork. Those in a hurry can walk directly to the Kühroint-Alm. The path across the Grünstein is however more pleasant: The trail leads steeply up through the scarps of the Weiße Wand to the serviced Grünsteinhütte and in 15 minutes to the Grünstein’s summit, a wonderful vantage point across the Berchtesgaden basin. The trail leading further to the Kühroint-Alm branches off not far below the hut. The trail from the Kühroint-Alm now initially runs quite comfortably – a short section is secured with cables – to the Falzalm. Across the steep slopes of the Falzköpfl and along many serpentine curves, you will reach the long-since visible Watzmannhaus. Today you will be climbing up onto the ‘head’ of King Watzmann! The ascent to the summit should only be made with a light day-pack. A plentiful breakfast will provide you with the necessary basis. Thereafter, climb over the giant slopes of the Hocheck in a zigzag to the shoulder, and in doing so a rocky passage is made easier with safety cables. Finally, follow the ridge to the summit and to a well-earned rest right at the top. The return to the hut is along the same route. Collect the rest of your gear which you deposited here and walk across the Falzalm and Mitterkaseralm meadows down in the direction of the Wimbach bridge until, again quite deep down, branch off into the Wimbach valley. On a comfortable, quite level path, now wander unhurriedly along the valley, notice how the broken rock of the debris-flow gradually edges further down into the valley and how the surrounding nature is forced into a continual fight for survival. 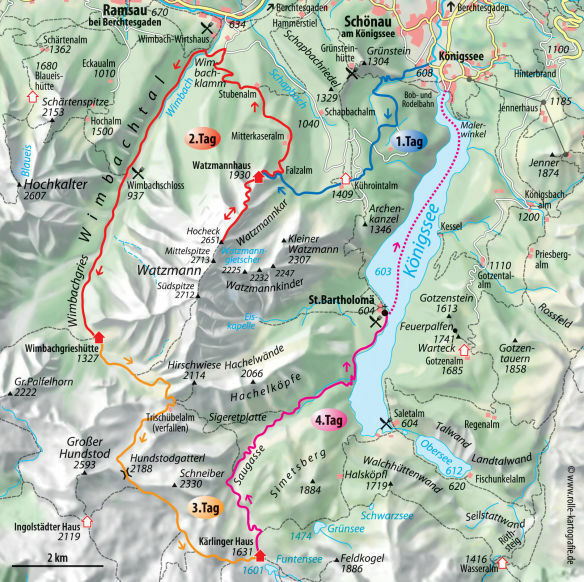 Above all, the magnificent backdrop of the Hochkalter and Watzmann massifs accompanies you along the way. Finally you will arrive at the Wimbachgrieshütte – a placid retreat in this imposing alpine setting. Well rested, and fortified by a hearty breakfast, which you have perhaps taken sitting in front of the hut in the sunshine, follow the Wimbach debris-flow right to the head of the valley. The path now ascends noticeably steeper to the Trischübelalm, and from here just a little further up and then down again to the fountainhead beneath the Graskopf, so as then to lead up through the Hundstodgrube (pit) to the Hundstodgatterl (run). The trail now snakes along below the eastern scarps of the Hundstod peak, until the view to the south becomes free again. The Ingolstädter Haus comes into view, but walk onto the left fork towards the Kärlingerhaus. The path now takes you along the edge of the karst plateau of the Steinernes Meer, without any great change in height, but continually up and down, until it finally leads down to the beautifully-situated Kärlingerhaus on Funtensee. Bid farewell today to the Steinernes Meer, by once again wandering across its plateau. 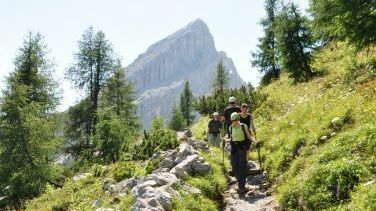 After a relaxing sleep and a hearty breakfast, the path takes you slowly downward across the karst area, until you are standing at the start of the Saugasse, a steep, narrow cut-away gulley. But no need for concern: Well constructed, flat, serpentine curves lead surprisingly easily down onto the valley floor. Only the rock faces will take your breath away, accompanying you along your descent. At the end of the Saugasse, enter into an enchanted fairytale forest of ancient, giant trees that flank your pathway to Königssee. The final highpoint of this 4-day tour is the spectacular hike along the shoreline of the lake to St. Bartholomä, with its famous Baroque church and its inviting restaurant. You can then sail back by ferry across the Königssee and to the bus stop in Königssee village. Take the train from Munich Central Station to Berchtesgaden (2,5 hr.) and back.